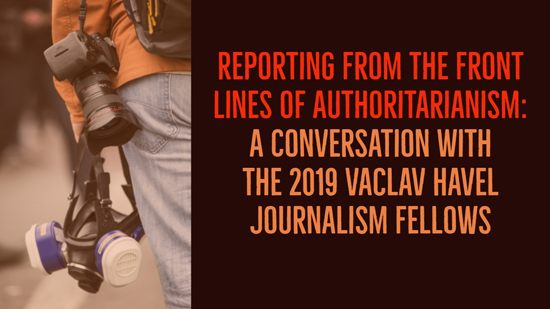 The Vaclav Havel Journalism Fellowship is an initiative of Radio Free Europe/Radio Liberty and the Ministry of Foreign Affairs of the Czech Republic and is generously supported by the Dagmar and Vaclav Havel Foundation VIZE97. Inspired by the late Czech leader’s belief in the transformational power of free speech and building on RFE/RL’s legacy of promoting more open societies through journalism, the Fellowship is targeted at young journalists from countries within RFE/RL’s broadcast region. In an era of resurgent authoritarianism and the growing influence of state propaganda, developing independent journalistic talent is more important than ever. Emerging young voices in independent media from Moldova, Georgia, Azerbaijan, the Russian Federation, and Armenia, discussed the common challenges they face while reporting within their home countries and across the region. Special introductory remarks were given by Tomáš Petříček, the Minister of Foreign Affairs of the Czech Republic, and Joanna Levison, the Director of Media and Public Affairs at RFE/RL. Carl Gershman, the President of NED introduced the Foreign Minister.